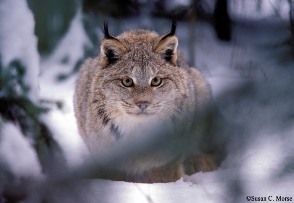 Join award-winning wildlife conservationist Susan Morse, visiting guest speaker from Vermont, for a slide show on lynx, bobcat, mountain lion, and black bear! Experience Susan's astounding wildlife photography and unique insights into the field of wildlife tracking. Learn about how citizen participation in grassroots, landscape-scale conservation initiatives can help protect and conserve valuable wildlife habitat. Susan will share exciting stories and information about her research on scent marking and behavior. Directions to Alderleaf: From Monroe go south on Highway 203 approximately one mile. Turn left onto Ben Howard Road. Follow Ben Howard Road for approximately 6 miles. Turn right onto Cedar Ponds Road. Follow Cedar Ponds until it becomes gravel. Take a left onto the second driveway. Our classroom is located in the large green building at the end of the drive. 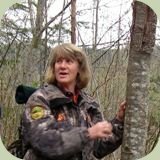 Susan has over 30 years of experience tracking and researching North America's large carnivores. She is a nationally-recognized naturalist and habitat specialist and has been featured in Audubon, Smithsonian, and Nature Conservancy publications as well as on NPR public radio. 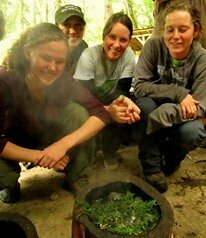 To learn more about Susan, visit her conservation organization at: www.KeepingTrack.org.